A locker is a small, usually narrow storage compartment. They are commonly found in dedicated cabinets, very often in large numbers, in various public places such as locker rooms, workplaces, division 10 (schools, prisons, hospitals), military and the like. They vary in size, purpose, construction, and security. They can be constructed from steel or plastics depending on the application. They are usually equipped with a lock or at a padlock lug (occasionally both). They are usually intended for use in public places and intended for the short- or long-term private use of individuals for storing clothing or other personal items. 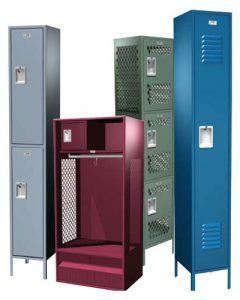 Lockers are offered as a free service to people participating in activities that require the safekeeping of personal items.